Carnegie Mellon University has redeemed itself by winning the $2m first place prize in the DARPA Urban Challenge. Stanford University took second and $1m, while Virginia Tech took $500k for third. Six vehicles of the 11 vehicles finished the sixty-mile course with Stanford, Carnegie Mellon and Virginia Tech all closing within a few minutes of each other. The robots had to complete a number of different missions, returning to the starting point each time to collect a new task. Meanwhile, teams from University of Pennsylvania, MIT and Cornell finished as well, although after the alloted six-hour limit. 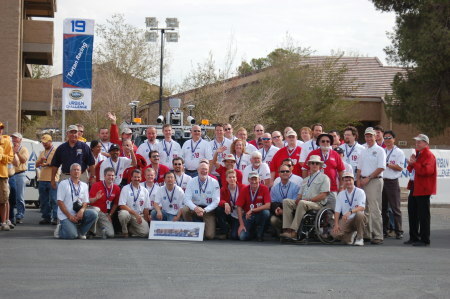 Individual winner aside, the contest proved a success for DARPA and for the advancement of robotics technology. Just three years ago, similar vehicles failed to travel more than a handful of miles along a desert course. In that race, the systems were hand-fed GPS points and needed only focus on speed while avoiding stationary targets such as ditches and trees. One year later, the vehicles mastered those tasks but were unprepared for facing more demanding tasks. Stanford won the second race, beating out a pair of vehicles produced by longtime robotics powerhouse Carnegie Mellon. The Stanford victory proved tough for Carnegie Mellon to swallow since the Stanford team is led by Sebastian Thrun - a former student of Carnegie Mellon lead Red Whittaker. This time Red got his revenge. In addition to the money, the winning teams received cheesy, giant eagle statues. Carnegie Mellon had to overcome a bit of adversity to take the victory. A jumbotron screen near the starting line crippled its GPS receivers. So, Carnegie Mellon had to replace its receivers and started about thirty minutes late. DARPA officials said that Carnegie Mellon averaged about 14 mph with Stanford and Virginia Tech slightly under that. Over the span of two years, the university teams have been the ones to show the most progress. Boosted by millions of dollars in government and corporate aid, the academics have crafted systems that can share the road with human drivers. The robots know how to take their turn at a four-way stop. They know how to follow traffic laws such as flashing their indicators when passing a slower car, and they can, for example, mimic the task of taking off from a garage to pick up a jug of milk and then return home. Would these robots fare well on the busy streets of a real city? No. In fact, even the winning teams suffered from the repeated stops and starts generated by confusion. Some cars would perform great, weaving through one way streets and intersections only to come to a complete halt in the middle of an open road. We'll be damned though if the day when you could flip your car into automatic mode while stuck in bumper-to-bumper traffic isn't far off. You'd still be lodged in the hell that is rush hour, but at least you could watch some TV or read a book during the process. Such a practical use of robotics technology could serve as a great boon for an industry that has relied more on fantasy than practical application for its charming aura. DARPA too benefits from this endeavor. The agency looked the clown in 2004 when it bumbled through the Grand Challenge, allowing too many teams to participate, changing rules at a whim and celebrating a $1m first-of-its-kind race that resulted in a stream of negative press reports. The organization must look better in the eyes of Washington officials now that it's figured out how to control the qualification events and overall structure of the race to almost ensure some sort of victory. Six teams finishing this more complex event beats out the five finishing the 2005 challenge by a significant margin.